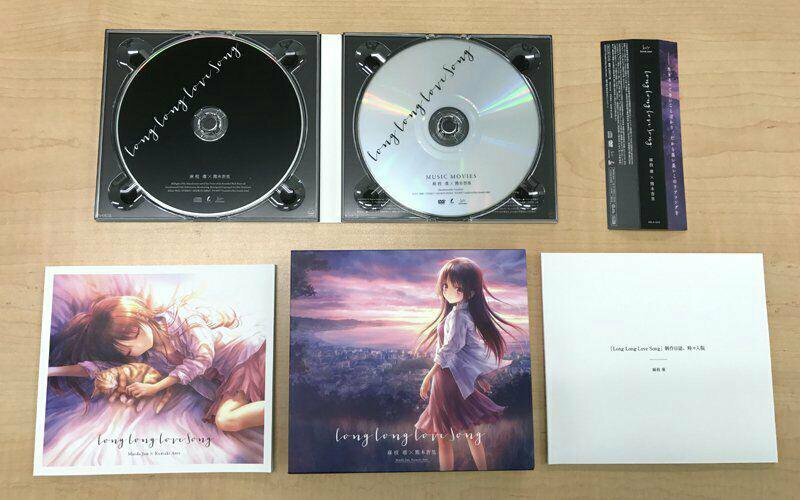 Today, July 26 2017, marks the much-awaited release of Jun Maeda’s newest addition to his Love Song music album series, entitled Long Long Love Song! Featuring Anri Kumaki, most notable for her roles in Charlotte and the Rewrite Anime, Long Long Love Song is a collection of multiple songs, each of which have accompanying artwork and stories, much in the format of the previous Love Song albums. Ever since its announcement a few months ago, we’ve been eagerly awaiting it’s release, and we’re sure you’ve all been waiting to get a chance to listen to this album in full, too! As previously mentioned, Long Long Love Song comes in two versions: the regular edition, which contains just the CD and a booklet with the artwork; and a limited edition, which comes in special packaging (as seen above) and a DVD containing the promotional videos for Bus Stop, Bokura Dake no Hoshi, and Kimi Dake ga Ite Kureta Machi. You can pick up the CDs on both Amazon.co.jp (Regular/LE), which does ship internationally for this item, or from CDJapan (Regular/LE). So, have any of you already started listening to it? Let us know what you think of the album in the discussion below, or you can head to our Love Song General Discussion topic, and discuss each track in more detail in their respective topics. Edit: As you can see below, they are working on a downloadable version. Jun Maeda×Anri Kumaki's new album was released in Japan.